Clever researchers have found a way to coat paper with nano-particles that permit multiple uses - write with light and erase with heat. 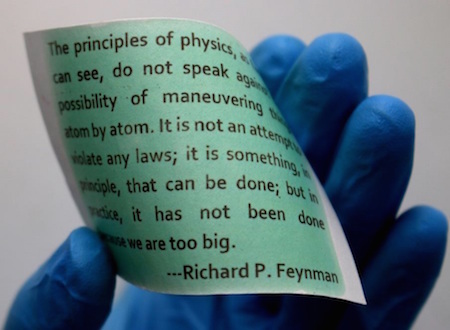 "The greatest significance of our work is the development of a new class of solid-state photoreversible color-switching system to produce an ink-free light-printable rewritable paper that has the same feel and appearance as conventional paper, but can be printed and erased repeatedly without the need for additional ink," Yadong Yin, Chemistry Professor at the University of California, Riverside, told Phys.org. "Our work is believed to have enormous economic and environmental merits to modern society." Science fiction writers are trying to encourage the process of getting rid of dead tree-based communication: in his 2003 novel Darwin's Children, Greg Bear uses a similar idea, a reusable sheet of display paper; read about e-sheets and zip paper from Mariposa (2009). Also, take a look at Mediatron and Runcible, both from The Diamond Age, by Neal Stephenson. Update 27-Feb-2017: Consider the light absorbing/light emitting ink from Gravy Planet (1952) by Frederik Pohl (w/CM Kornbluth). End update. See also Disappearing Ink On Self-Blanking Paper; Winchell Chung recommended that story, too. Via PhysOrg. Thanks to @nyrath for pointing this out; sorry I could't remember a better sfnal precursor.